Matt de la Peña was awarded the Newbery Medal and a Caldecott Honor for Last Stop on Market Street, a children’s book that highlighted volunteerism, income inequality, and other topics not often addressed by the genre. The author of six acclaimed YA novels and the popular picture book A Nation’s Hope: The Story of Boxing Legend Joe Louis, he has taught creative writing throughout the U.S. The author and illustrator of the New York Times bestselling Otis series of books, Loren Long also illustrated Barack Obama’s mega-popular Of Thee I Sing and re-illustrated the children’s classic The Little Engine That Could. 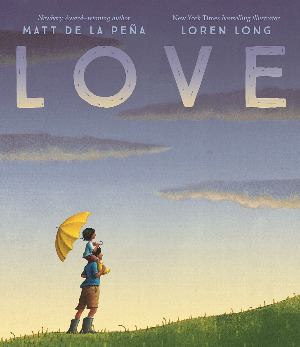 In Love, de la Peña and Long depict the myriad wondrous ways we experience that most universal of bonds throughout our years.